Oh what a night or day in fact. 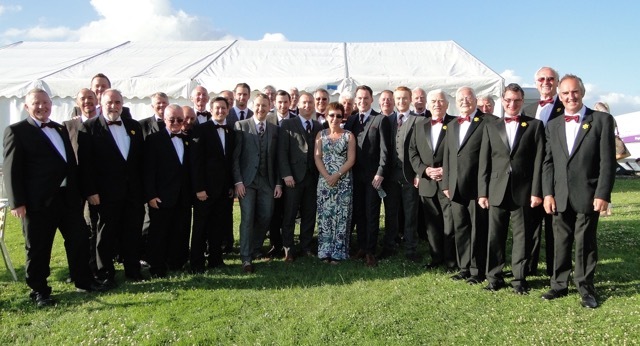 Last Sunday, may be remembered for the Greek ‘no’ vote or the christening of royal baby Charlotte but over 1,000 people should remember it for a concert in Pembroke Castle where Tenby Male Choir performed on the same bill as Only Men Aloud. The entire audience was certainly left with something to remember. ‘Warming up’ for a superb, professional act with its sound systems, its lighting, the professional choreography and full time practice sessions had to be a challenge for a local group of part-time amateurs. But we stood tall and had a fantastic reception. We came armed with some 35 voices, a piano and the benefit of our regular two evenings a week rehearsals to rely on, but we also had a person to bring to life that piano in Jill Williams and our Musical Director Ian Williams to harness our limited materials and produce a stunning result of 100 per cent live singing and entertainment. If we were a warm-up act, then we got the audience boiling over at times and culminating in a standing ovation. We gave the audience variety in heart-rending songs like Anthem from Chess and Bring Him Home from Les Miserables. We gave them sing-a-long songs like Climb Every Mountain and The Hippopotamus Song. There was audience participation with My Grandfather’s Clock and our very own Yugoslavian trilogy and unforgettably the finale was The American Trilogy which certainly was perhaps the ‘tingle moment’ of ‘tingle moments’ for the crowd. There were three soloists on the night further demonstrating our versatility with Eric Mullins singing The Hippopotamus Song, Paul Varallo with Return to Sorrento in Italian where the final long held note earned a huge round of applause from an enchanted audience. Last but not least, founder member Tom Pearce in his home town appropriately sang My Little Welsh Home when you could have heard a pin drop. All of these solos can be heard on our new CD Hwyl a Hiraeth, along with many others in our wide repertoire. It can be bought at any concert or online via our website. Thanks also go to the highly efficient support and security staff who were always helpful and our apologies for those who had to collect up the underwear on stage at the end of the performance. I mentioned in a recent report that male voice choirs are having difficulties surviving in places, but in the war against survival a major battle was won in the fitting surroundings of the towers of Pembroke Castle on Sunday. If you missed out on the night, you can see us for free tonight at Lawrenny Ferry starting at 7.30. This is a great occasion on a nice summer’s evening where there will be a barbecue available. If you can’t make that, then there is a further chance to see us free at the Giltar Hotel, Tenby, on Tuesday, July 14, or at a charity concert in aid of Huntingdon’s disease which will be at St.Mary’s Church, Tenby, on Thursday, July 16. Tickets for this will be available on the door.